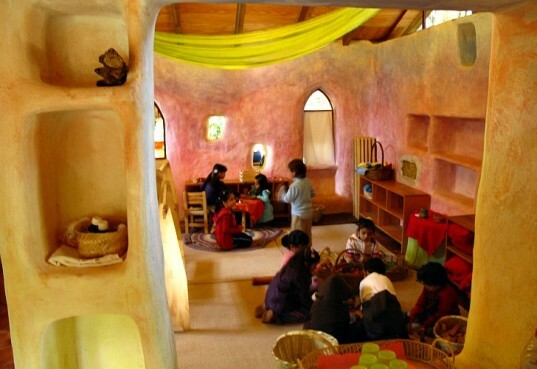 Like a cottage straight out of a fairy tale, the Tecilli Classroom in Cuernavaca, México is a beautiful, dreamy space designed to inspire the young minds who attend. The Waldorf preschool classroom was built over an 8 week period with the help of community members who used sustainable materials and strategies to help reduce the school's carbon footprint and generate a positive impact. Designed by Laboratorio Arquitectura Básica Mx, the strawbale classroom makes use of locally-sourced agricultural waste straw, daylighting and other natural materials to create a charming space in which to learn. “Tecilli” means butterfly cocoon in Nahuatl, and the classroom is meant to be a cocoon in which to nurture the children who come to school there. When plans for the school were just beginning, the teacher asked for it to be like a fairy tale room with arches and curves, niches and colorful walls. With the chosen method of construction, strawbale, the arches, curves and an organic feel were easily achieved. Nooks for storage, peep-hole windows and decorated walls were all incorporated into the room. The main building material, strawbales, were made from locally-sourced agricultural waste straw. Using strawbales from local sources prevents the burning of the material and resulting CO2 emissions into the atmosphere, and it also eliminates the use of costly building materials and energy consumption. Inside the preschool, natural daylighting and ventilation create a healthy and vibrant space in which to learn, plus they help reduce energy use. 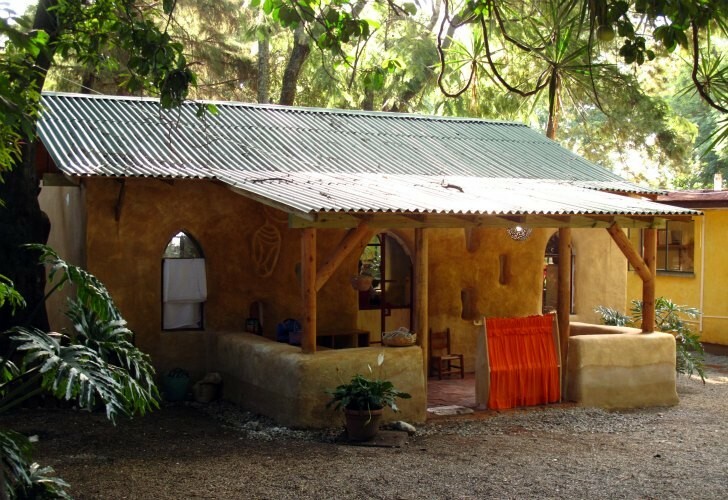 Additionally the super thick strawbale walls, which are covered with local clay, give thermal and acoustic insulation. The walls are coated with a clay plaster and a natural earthen / lime paint mixture, which in some areas was sculpted into decorative shapes. A group of community members and parents were invited to help build the school and thus strengthen the bond between the school and community. The result is very beautiful and also much more cost effective. In total the project took about 8 weeks and it only cost about $20,000. locally-sourced agricultural waste straw, 8 weeks, about $20,000 and sweat of parents and community workers - The result a sustainable, inspiring classroom! The project reminds Christopher Alexander's book "production of houses" where houses are designed and built with local materials and sweat equity from future inhabitants! "Tecilli" means butterfly cocoon in Nahuatl, and the classroom is meant to be a cocoon in which to nurture the children who come to school there. When plans for the school were just beginning, the teacher asked for it to be like a fairy tale room with arches and curves, niches and colorful walls. With the chosen method of construction, strawbale, the arches, curves and an organic feel were easily achieved. Nooks for storage, peep-hole windows and decorated walls were all incorporated into the room. The main building material, strawbales, were made from locally-sourced agricultural waste straw. Using strawbales from local sources prevents the burning of the material and resulting CO2 emissions into the atmosphere, and it also eliminates the use of costly building materials and energy consumption. Inside the preschool, natural daylighting and ventilation create a healthy and vibrant space in which to learn, plus they help reduce energy use. Additionally the super thick strawbale walls, which are covered with local clay, give thermal and acoustic insulation. Construction on the preschool commences and begins with the foundation, the supports and the roof. Members of the community help build the structure through workshops. A group of community members and parents were invited to help build the school and thus strengthen the bond between the school and community. The walls are coated with a clay plaster and a natural earthen / lime paint mixture, which in places was sculpted into decorative shapes. The result is very beautiful and also much more cost effective. In total the project took about 8 weeks and it only cost about $20,000.